Acres of fun 3kms from Blueys Beach. Special price for school hols. Like having your own resort with tennis court. Charlotte House is a unique timber home. It has a championship sized tennis court and has a warm and welcoming feel. Firewood is supplied by the owners for the fireplace inside as well as the campfire behind the tennis court. The fenced yard is great for children and dogs that are happy to be outside. We are happy for them to be on the verandas and can sleep on the back enclosed verandah. Your own tennis court, basketball, table tennis at the house. The beaches and lakes are a 3 minute drive away. We also have a little cafe with great food and coffee 70 metres away. The outside camp fire behind the tennis court is great all year round- please check for fire bans. Guests love the in- built bar, the fully equipped kitchen, the large covered verandah with party lights for night, the championship sized tennis court and the privacy that they have on ACRES - surrounded by trees and palms. The house is not available for parties, but family gatherings / celebrations are most welcome. The house is booked for guests listed only. Noise levels need to be considered as there are neighbours, even though you can't see them. The house has free WI-FI and FOXTEL in the large living room. If you have boats, kayaks, surf boards etc- there is plenty of room for them on the property in a very safe environment. If you would like to have linen and bath towels provided this can be arranged by Rita who is happy to help you out. She can be contacted by and her number is and is about $30 per person for your stay. Contact Julie for her details. The owners Julie and John take pride in the property - always freshly mown lawns, tidy tennis court and the house is always well presented. You will be met by Julie or a friend who will show you through and give you the key code.. Guests are always excited to be shown through and are surprised at the size( bigger than expected) and the different areas of the house. We love to return full bonds to all our guests as we know the house has been well treated and enjoyed. The photos show most of the property and close by beaches and lakes. At the end of the photos is a site plan of the acreage and a plan of the house. As the crow flies Charlotte House is just over the hill from Blueys Beach. Charlotte House is situated on a private acreage between the best beaches and lakes in the Pacific Palms area. It is only a short 3 minute drive to every location- whether to local shops, beaches, lakes, clubs. Its central location is ideal to investigate this lovely part of the coast and to have a relaxing time when you return from the many activities on offer. The local beaches are Blueys, Boomerang, Elizabeth, Shelleys and Cellito. Local Lakes are Wallis Lake, Smiths Lake and Myall Lakes. Seal Rocks is must see and a walk to the lighthouse. Lots of fun and choices for surfing, paddle boarding, swimming, fishing, boating, kayaking and walking. When you come home from whatever activity, the house provides much more to enhance your already great day's outing- from playing tennis, basketball, riding bikes, enclosed children's playground, table tennis or just relaxing on one of the 3 verandahs or living areas or watching movies, FOXTEL or DVD's in one of 3 areas. Relax away from the crowds and other houses. An extra 520 litre fridge can be used from the garage storage area - giving over 1000 litres of fridge and freezer space for the longer stays with families and friends. Your very own tennis court is there for you 24/7 - no need to book, just enjoy when you want to- walk out the back door and onto the championship size court. There are racquets for both tennis and table tennis, but if you have your own and are enthusiasts , please bring your own. The table tennis table is left upright in a covering as it is to be used only for table tennis and not as a table for drinks, wet suits etc. The house has 5 bedrooms- all in separate areas. 2 double bedrooms with ensuites- double beds. A large bunk room with 3 beds down and one up. Also two new spare single mattresses under the beds. All bedrooms are large enough to have cots for babies. One pull-out double sofa in the sitting room. We have 2 Queen Eurobeds ( 5 star inflatable ) for the couples getaway. That makes 3 queen beds and 2 doubles. There are three living areas: one with a fire place- fire wood supplied by Julie and John. A large family room with TV and Foxtel and lounges and chairs with recliners for total relaxation and a sitting room with a piano and a guitar. The entrance to the house is from the large L shaped verandah with a table that seats 14 and a table tennis table- great to escape the heat and lovely to gather for BBQ's. There is a hooded 4 burner BBQ near the verandah for those tasty BBQ's AND Party lights for night- time to help set the scene. There is a back gauzed verandah that bedding can be provided for, for your pets. The verandah is very relaxing with it's own lounge and chairs to relax on. This goes to an enclosed yard. The last verandah is off the kitchen at the front of the house - very pleasant to sit quietly, have a cuppa, read the paper and/or listen to the bird life. There is a large fully equipped new eat-in kitchen with all facilities including regular cleaning products, tea towels, glad wrap alfoil etc. There is a magic bullet for your enjoyment. There are three bathrooms (one with the laundry), 3 toilets, 4 showers, small bath and larger bath in the double bathroom. The property is easy to find as it is just off the Lakesway before the Blueys Beach turn off. Where you turn off is Café Gate and Bee 70 metres from the house- great coffee and delicious food. Many guests have enjoyed the house's close proximity to the Café.. just a walk over the bridge. Families that span generations, 2-3 families, sometimes 4 depending on size or 3-5 couples. Groups who come for a yearly get away. Events held in the area with many wedding guests, sailing and surf carnival guests enjoying all that the house has to offer. Schoolies and university groups have greatly enjoyed their holiday here. There is a different set up with bonds and payments so talking directly to the owners is advisable. Whether relaxing- looking out on the trees, gardens and bird life, playing tennis, reading a book, sitting by the fire or camp fire, surfing, swimming or relaxing on or in the nearby beaches or lakes, this is a unique holiday experience. Also the two local clubs offer a courtesy bus pick up to take you there- a gold coin donation is payment. Neighbourhood noise needs to be respected even though the property is on a private acreage. You will need to supply your own sheets, pillowslips and towels. Doonas, blankets, pillows, bath mats and tea- towels are provided. If you would like to have linen and bath towels provided this can be arranged by Rita who is happy to help you out. Her number is ...... and it is about $30 per person for your stay. Contact Julie for bookings and any other information needed by making an enquiry. From Sydney....Head north on the M1 Freeway from Sydney, then onto the Pacific Highway past Newcastle and head to Bulahdelah. 2kms past Bulahdelah turn right onto the Lakes Way. Travel 40 kms, past the turn off to Seal Rocks, Smiths Lake and then past the Coomba Park turn off on the left . You do not leave the Lakes Way until you come to Kookie Ave which is less than 1 km past the Coomba Park turn off. Look for a blue sign Charlotte Bay Cafe - 200 metres and turn left into Kookie Ave , the Cafe on the corner is Bate and Bea... travel 50 metres, over a small bridge, you can see the "Charlotte House" sign in front of a large pine tree, then turn left to a brown house where you can park in a garage. From Brisbane. Travel down the Pacific Highway past Taree and turn left at the sign to Forster /Tuncurry. Travel through Forster and continue along the Lakesway 20kms. Travel past the Recky along Wallis Lake and for another 3 kms. There is a blue sign for Charlotte Bay Cafe. Turn right at what is Gate and Bee Cafe and continue to the house as per instruction above. 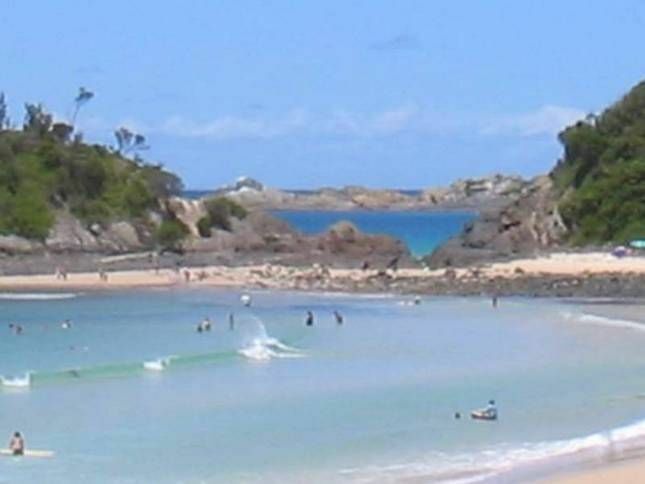 The local beaches of Blueys, Boomerang, Elizabeth, Shelleys and Cellito are waiting for you three minutes away as well as Wallis, Smiths and Myall Lakes. The local National Parks with rainforest tours and bird watching are also ready and waiting....... OR maybe a joey might bound by in one of the near-by paddocks. Pacific Palms - otherwise known as "Paradise" to the locals, has something for everyone. From Charlotte House it is a three minute drive to any of the local beaches, lakes, or shops. Julie has folders that gives information on all the attractions and more. It is a short drive or walk to many places including the popular Forster/ Tuncurry just 20 mins drive north where there are many shops, restaurants, a cinema, dolphin cruises etc. OR a 20 minute drive in the other direction takes you to the popular and very beautiful Seal Rocks with one of Australia's best light houses. For the sporting enthusiasts there are the many beaches, National Parks and lakes with fishing, boating, kayaking, snorkelling, swimming, horse riding, walking and surfing being just some of the sports. A golf course is only 5 minutes away and the tennis court is in the backyard. Table tennis is on the verandah. Walking along Wallis Creek in the mornings is relaxing. Put in a kayak and paddle up the creek into Wallis Lake. The Recreation Club is renound for its seafood. Sit on the balcony as the sun sets and stay on for a fish dinner. Courtesy buses will collect you by ringing the club. We live close by and love this area. This was our family home so we know it well. It grew with the family and has had recent renovations to kitchen, bathrooms and flooring. Our adult children live in Sydney and love coming home to rejuvenate from the city life. We all loved playing tennis and our son represented Australia and played in all the Grand Slams. John and I love welcoming people to our area and are happy to assist with holiday planning. Great privacy and fun after the days activities- lots of space for children and adults to play games and have fun. All 5 bedrooms are private- none are next to the other. Not far to get anywhere and lots of choices that don't require money- just beautiful nature. Woolworths will deliver to the house as well.--lots of storage space. A local supermarket will be opening soon very close by and will be great for grocery shopping. Championship sized tennis court- great for tennis, children learning to ride bikes, basketball , cricket etc Two great Clubs- Recky with best sunsets and dinner and Smiths Lake Bowling Club has barefoot bowls and makes great Pizzas, also a Pizza Delivery service and will pick up and drop off for the convenience of not having to drive. Three local restaurants- Kembali, Kingfisher and Red Gum. Table tennis on the covered verandah at the front. 3 verandahs - all covered from the sun. Outdoor table setting by the tennis court Privacy and lots of fun!!! toilet, shower, Ensuite , but can be accessed by family room as well. In lounge room - heats up the house beautifully. Large fridge and freezer in kitchen and another in storage room off garage - if needed. Table can have 6 chairs around it for winter dinners. On the verandah is two tables. One seats 14 and the other 4. Best beaches and lakes on the Mid North Coast- just beautiful and the weather is great 8 - 9 months of the year. The house is in a good location. The house has a lot of beds but the layout is abit confusing. Walking through 2 bathrooms side by side to get to a bedroom is abit weird. Nice but dated - don’t expect to be wowed. The tennis court is a fun thing to have at the house. Concrete base not synthetic. Not a championship court as stated. Still fun for a muck around. Bring the mozzie repellent. We had abit of rain and the surrounds are very swampy. The owner stopped in a couple of times to say hi which was abit weird. Clean the house well when you leave. Even though there is a cleaning fee in the price the owner wasn’t impressed with cleaning. The house was left very tidy minus a vacuum and hosing of the deck but still complained. This review is written by a dishonest person who had a bucks party with 22 people there when it clearly states on the website no parties. The photos show all the house and the tennis court which is true to what you get- most people love it. There is even a map of the property and house. This person was only interested in one thing- having a party on acres and securing the house for that purpose. He said it was a father and son trip and I said - not a bucks party? No, he replied- just a fishing trip. I met him on arrival as I always do and he said there would be only the 6 people there tonight and only 11 were coming. The others would turn up on Saturday.... but neighbors complained of the noise that night and said there was about 14 cars parked around and many young males drunk and disorderly. I drove past on Saturday to see what was happening and counted 14 cars and many young males all drinking and playing tennis. They had lit a large fire and I said they should put it out as it was a total fire ban as we hadn’t had rain. That afternoon it rained and they had all the furniture from the verandahs out and they all got wet. After they left the BBQ hadn’t been attempted to be cleaned or the verandah as there was food and bottle tops still on the floor. I knew we’d had rain so I checked the furniture and they were all wet. I put them in the sunshine to dry. This person can’t tell a truth and has written this review as dishonest as he is. It was a breach of the house rules and extremely disrespectful. He left without saying the furniture and cushions were wet and I was very kind and returned his bond in full- just grateful that the house was in tact. I would not recommend renting to a person who is obviously has no respect for others properties. As you can read from other reviewers- the house is a lovely holiday place and everyone has a great time. You are welcome back anytime and so glad you had a great celebratory weekend with family and enjoyed the spaces that the house offers. Great facility for large groups and/or multiple families. The house has all you need for a great trip away. Smack bang in the middle of where you want to be in this region. Julie was a pleasure to deal with and we’ll definitely be back again. Warm accomodation in such a nice setting, even in winter the area is lovely with birds whistling and fire crackling. Definitely a must go to if visiting north coast. Thank you Julie for the nice hospitality! Thanks Chris, for a lovely review. You were a pleasure to chat with and as I am away everyone was happy with your group too, as the house was left well and I’m very happy you had a great time.You and your group are welcome anytime. The house is very clearly well loved and well maintained. Full of all the required equipment for a pleasant stay. We had a large group for the weekend and there's plenty to do at the property itself. Quiet and private and in a good spot to take little day trips to Forster or Seal rocks etc. Fenced yard is perfect for the kids and the little cubby house and swings provided plenty of entertainment. Plenty of wood for the fire inside and the fire pit outside. Thanks Zoee- it is a great spot for families and groups with plenty to do after beach play and investigating the local area. You left the house well and will be welcome back anytime. Great holiday house for family gatherings. Julie and her husband were wonderful hosts. Any concerns we had were dealt with without delay. The property was clean and comfortable. There was plenty of space inside and out for our family group of 6 adults, 4 children and 2 dogs. The children enjoyed riding their bikes around the tennis court, playing in the cubby house and toasting marshmallows in the fire-pit one evening. They also loved the milkshake cafe in Forster! The wood burning stove in the lounge kept us warm during the winter evenings and supplies of wood were plentiful. The property is within an easy 20 minute drive to Seal Rocks - a perfect spot for a picnic, view the lighthouse and play on the beach. It's also only 5 minutes to beautiful beaches at Blueys, Boomerang and Elizabeth. I would certainly recommend this property to others. Thanks Lindsey- so glad you had a wonderful time with your family and enjoyed the local area. You are welcome back anytime. Julie will point you in the direction for the best beaches and lakes for your group.